Improve the synergy of basic and applied behavioral and social sciences research (view video). Enhance and promote the research infrastructure, methods, and measures needed to support a more cumulative and integrative approach to behavioral and social sciences research (view video). Facilitate the adoption of behavioral and social sciences research findings in health research and in practice (view video). These priorities, according to the plan, “were determined based on their potential to have the greatest impact on the largest proportion of health-related behavioral and social sciences research.” To address the priorities, OBSSR intends to depend on four foundational processes, which are “central functions consistent with the OBSSR mission that can be marshalled to meet the objectives of the scientific priorities” outlined in the plan. The four processes are communication, program coordination and integration, training, and policy and evaluation (view video). Upon releasing the plan, Riley acknowledged that OBSSR received “excellent support for the development of this plan from NIH leadership, including the NIH Director and Deputy Director, the Director of the Division of Program Coordination, Planning, and Strategic Initiatives, and from NIH Institute and Center Directors.” Additionally, NIH Director Francis S. Collins and Riley authored an editorial published in Science Translational Medicine highlighting scientific and technological advances that are transforming the behavioral and social sciences. The OBSSR Strategic Plan 2017-2021 can be downloaded here. On December 2, the National Institutes of Health (NIH) Office of Behavioral and Social Sciences Research (OBSSR) held its inaugural NIH Behavioral and Social Sciences Research Festival. The new annual event is designed to highlight the contributions of recently funded behavioral and social science projects to health research via presentations by extramural and NIH scientists from across the spectrum of disciplines. Panel discussions highlighted new directions for health-related behavioral and social science “addressing the synergy of basic and applied research, innovations in methodology and measurement, and the adoption of research findings into practice.” Welcoming festival participants, OBSSR Director William Riley explained that the event was designed to be a “day for behavioral and social sciences at NIH to get together to highlight some of the research” that the Office has funded over the past year. Riley also discussed the “state of the science,” highlighting some of the NIH-funded research. Jim Anderson, Deputy Director of NIH Coordination, Planning, and Strategic Initiative, cited the rapidly advancing progress in digital capturing of behavior and social data and our ability to use big data patterns, interpret them, and return them to individuals to influence their behavior to improve health. He also praised OBSSR’s recently released strategic plan (see related story), noting that the plan “takes advantage of a lot of the research and technological digital data use, and also moving behavioral and social science closer to human applications.” Finally, Anderson pointed to NIH’s Big Data to Knowledge (BD2K) initiative, emphasizing the “exploding capability of dealing with data, finding patterns in data. It is just a golden age for behavioral and social sciences,” he concluded. A videocast of the Festival is available on the NIH website. On December 2, 2016, the National Institutes of Health (NIH) Office of Behavioral and Social Sciences Research (OBSSR) will hold an inaugural NIH Behavioral and Social Sciences Research Festival. Intended to become an annual event, the festival “will highlight recently funded contributions of behavioral and social science to health research.” It will also “explore new directions for health-related behavioral and social science research.” The event is tailored to build the “understanding and capacity to implement transformative behavioral and system interventions that lead to sustainable improvements in health and well-being.” The festival agenda and additional information is available on OBSSR’s website. In an August 31 blog post, National Institutes of Health (NIH) Office of Behavioral and Social Sciences Research (OBSSR) Director William Riley announced the convening of a 2017 National Academies workshop that is being sponsored by OBSSR and the National Science Foundation (NSF) Social, Behavioral, and Economic Sciences (SBE) Directorate. The workshop will address the current and future training needs in the behavioral and social sciences and responds to the various reports in recent years that “indicate that a majority of behavioral and social sciences doctors are entering research careers in areas outside of the traditional academic research track; and even those going into academia face challenges initiating and maintaining a grant-supported research program.” Along with the “emerging technologies and big data efforts that are transforming the approaches and methods in the field, rethinking the graduate education of behavioral and social scientists is clearly needed,” Riley further noted. The OBSSR director shared that the project “has broad government support from the Social and Behavioral Sciences Subcommittee of the Committee on Science of the National Science and Technology Council (NSTC)” and has been identified as a “pressing need.” In addition, reexamining graduate training in social and behavioral sciences is a significant area of focus in the OBSSR’s Strategic Plan 2017-2020. Read Riley’s full blog post here. The National Institutes of Health (NIH) Office of Behavioral and Social Sciences Research (OBSSR) is holding two webinars to present the Office’s 2016-2020 Strategic Plan and to solicit feedback from the scientific community, including “researchers in academia and industry, scientific or professional organizations, public health and health care professionals, patient advocacy organizations, and other interested members of the public.” OBSSR Director William Riley and Deputy Director G. Stephane Philogene will present the 2016-2020 Strategic Plan during both webinars; the information provided will be the same. The webinars are scheduled for Tuesday, May 10, 2016 (10:30 – 11:30 am EDT) and Thursday, May 12, 2016 (2:00 – 3:00 pm). Registration is required at the links above. 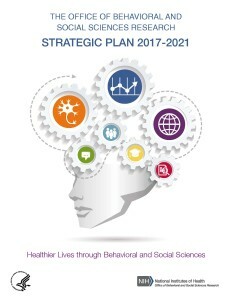 As part of the National Institutes of Health (NIH) Office of Behavioral and Social Sciences Research (OBSSR) strategic planning process to update its 2007 strategic plan for fiscal years (FY) 2016-2020, the Office plans to reconsider NIH’s definition of behavioral and social sciences (BSSR). In his recent OBSSR Connector blog post, OBSSR Director William Riley explained that the office is Congressionally mandated to “define behavioral and social sciences research to assess and monitor NIH funding.” As a consequence, the current definition “resulted in a high level taxonomy of BSSR and delineates basic versus applied behavioral and social sciences research with a range of examples for each.” Riley noted that in order to revise the current definition, NIH must acknowledge “that there is no single discipline of ‘Behavioral and Social Sciences Research;’ instead the field is a multidisciplinary set of sciences.” The definition of these sciences “are evidence that behavioral and social sciences cover a broad expanse of research interests from interpersonal mental processes, through large scale social and cultural constructs.” Emphasizing this is “more than a philosophical exercise,” Riley stressed that OBSSR intends to “develop a revised, contemporary definition of BSSR” with stakeholder input. OBSSR convened an expert panel to provide input into its strategic plan in January (see Update, February 8, 2016). On January 19-20, the National Institutes of Health (NIH) Office of Behavioral and Social Sciences Research (OBSSR) convened an expert panel to provide input into the Office’s strategic planning process as it works to update the 2007 strategic plan for FY 2016-FY 2020. The meeting follows a series of internal meetings and a November 2015 request for information (RFI) (NOT-OD-16-018) seeking the broad input of the scientific community and the public, including academia, industry, health care professionals, patient advocates and advocacy organizations, scientific and/or professional organizations, and other federal agencies regarding the scientific priorities that should be considered in the update strategic. In a January 26 blog post, OBSSR Director William Riley noted that he and the OBSSR staff were “energized and encouraged by the passion and urgency” the panel provided and highlighted some of the key messages observed during the meeting. A summary document will be developed based on the meeting discussions followed by a draft strategic plan, which will be made available for public comment. In addition, OBSSR plans to consult with relevant stakeholder groups to solicit feedback through an RFI and develop the proposed final plan to submit for final approval by the NIH director. In 2015, the National Institutes of Health (NIH) Office of Behavioral and Social Sciences Research (OBSSR) and the NIH Basic Behavioral and Social Sciences Opportunity Network (OppNet) jointly convened a panel of ten experts to “discuss basic psychosocial mechanism and processes involved with self-management” of disease and other related conditions. The science of self-management has grown exponentially over the last several decades. During this time, the NIH has provided support for clinical- and community-based interventions and programs related to the management of acute and chronic illnesses, including asthma, arthritis, diabetes, heart failure, and HIV/AIDS. In particular, the National Institute of Nursing (NINR) has led NIH’s efforts in this area. Accordingly, strides have been made in understanding how to help individuals better manage their chronic conditions. Less attention, however, has been given to examining the “internal mechanisms under the skin whether they are the psychological process, group ties, and biomarkers linked to those behaviors.” The workshop was an effort to develop a research agenda that would allow an investigation of these factors. OppNet’s goal is to increase the amount and breadth of basic extramural research supported by NIH. The videocast of the workshop, Self, Others, and Chronic Conditions: Basic Mechanisms and Processes that Facilitate or Impede Self-Management, is available for viewing on the NIH’s website. In addition, a series of guest blog posts covering a variety of self-management topics is available on the OBSSR Connector website.